First things first. Nothing in this post is sponsored. No #ad, not #spon and I bought all products mentioned myself. AS IF someone paid me to write this… but if you want to pay me, get in touch! I thought being in my early 30s was enough of a punishment without having to deal with spots. Yet, HERE WE ARE. So let’s get into it. Like many people, I have a spotty T-zone, dry cheeks and hormonal breakouts. The skin on my face can look quite dull and uneven. I wasn’t in the habit of being very kind to my skin, beyond daily washing and moisturising. Earlier this year, I set about fixing my wasteland of a face before The Wedding. I was quite out of the loop with skincare. Actually, I was never IN the loop, barring some dabbling in the Oil Cleansing Method a few years ago, which I still think is great. I saw an ad for The Ordinary range by Deciem and liked the look of the packaging. I have a slight aversion to shiny pretty skincare ranges, show me something that’s deliberately styled to be no-frills and apparently I’m SOLD. I knew sod all about skincare so I didn’t know the brand name, but I’ve since found there’s a lot of buzz around The Ordinary and the products have won loads of awards. – The Ordinary High-Spreadability Fluid Primer. This is for wearing under foundation, which I don’t do often, so I haven’t got much to say about it yet. The box of products came. I opened it, all excited, then realised I didn’t know how to use them. Felt really stupid. Hid the box for a couple of weeks. Eventually, I did the research. As I understand it, The Ordinary products are stripped back to their key useful ingredients, which is why they’re so cost-effective. On the other hand, figuring out how to use them is not the easiest. I’m not a skincare geek (I only just discovered skincare geeks are AN ACTUAL THING,) but here’s what I learned. With The Ordinary, you build up layers of different products. There are serums, creams and oils, and these should be applied in a that order. Some should be used at night before bed, some are best used in the morning. Some, when layered, can cause “pilling” which is when the product slides into little weird balls of crud on your face. Some should only be used a couple of times a week because the formulations are quite strong. Products with different pH levels shouldn’t be mixed. Products which do the same thing shouldn’t be used together. There’s some information here on The Ordinary site about how to build a “regimen” which will give you some basic instructions, but I found this blog from honestyforyourskin.co.uk really, really useful. There’s some great tips in the comments too. Once I’d got the rules straight, building a “regimen” felt less impossible, but getting to this point did feel like solving multiple logic puzzles. For face wash, I use a 99p job from Lidl – Cien Aqua Rich Gentle Facial Wash for normal and combination skin. It feels gentle enough to use twice a day. I had concerns that the “bits” were dreaded plastic microbeads, so I contacted Lidl and apparently “the beads are made from bamboo which is produced by grinding and sieving the sap of the bamboo. They are of vegetable origin.” So there we go, happy days. I use Lidl’s Cien Cleansing Face Wipes to remove make-up, 59p a packet. Mornings are simple, I do the same every day. Step 1. Wash face with Cien Gentle Facial Wash. Step 2. When face is dry, apply a thin layer of The Ordinary Niacinamide 10% + Zinc 1%. Step 3. When this is dry, apply Nivea Soft. A real skincare geek would put add an SPF here, but I’m a terrible person and don’t. Evenings are a little more complicated. Step 3 is always a product from The Ordinary, but I swap in a different one each day. Step 1. Cien Cleansing Face Wipes to remove make-up. Step 2. Cien Gentle Facial Wash to wash face. Once a week I’ll use Cien Daily Exfoliating Wash instead. Step 4. When product has dried, apply about four drops of The Ordinary 100% Organic Cold-Pressed Rose Hip Seed Oil. As I mentioned earlier, there’s a whole stack of rules for how to use The Ordinary products, and generally it means separating stuff out. That’s why I do the following with step 3. Sunday – Skip stage three. Day of rest and all that. This is much more complicated than I’m used to, but it’s worth it. My skin’s never looked better. Pay attention when applying Niacinamide 10% + Zinc 1%. I slathered it on too quickly when my face was still wet, not realising that it made chalky white smears all over my face. My driving instructor didn’t mention it during a two hour lesson, I only noticed when I got home. If you use the Azelaic Acid Suspension followed by Rose Hip Seed Oil, don’t overdo the Azelaic Acid Suspension. It’s tempting as it’s a cream with a nice texture, but you only need a light layer and you must wait for it to be absorbed before applying the oil. Otherwise, you get product “pilling” which is gross and I hate it. Applying the Rose Hip Seed Oil feels SO nice, but like most of the products here, you only need about 4 drops for your whole face. The oil gets absorbed within an hour or so, which is why it’s best for bedtime. Also, yes – putting oil on oily skin is a good thing, promise. Salicylic Acid is an ingredient found in spot creams, so if a blemish does start coming up, I’ll apply this directly, it helps a lot. After a couple of weeks, my skin became far less spotty and looked more even, which is exactly what I wanted. It also seems less susceptible to hormonal breakouts. I can’t pretend it’s flawless, even with all the help in the world it’s unlikely to look advert-perfect. Photoshop and make-up exists for a reason. Still, the regimen helped a lot. Success! I win! The Ordinary products are a good, cost-effective way to try different ingredients for your mug. You just need to get your head around the rules to build yourself a regimen and this does take a little effort. You can be super cheap with other products like face wash, if your skin is ok with them. Keep at it! With most changes to your skincare routine, the results won’t be immediate. I took a break from the regimen for a couple of weeks after honeymoon (ahem, I got lazy) and my skin suffered. Got any skincare tips you wanna impart? Am I doing something really wrong? 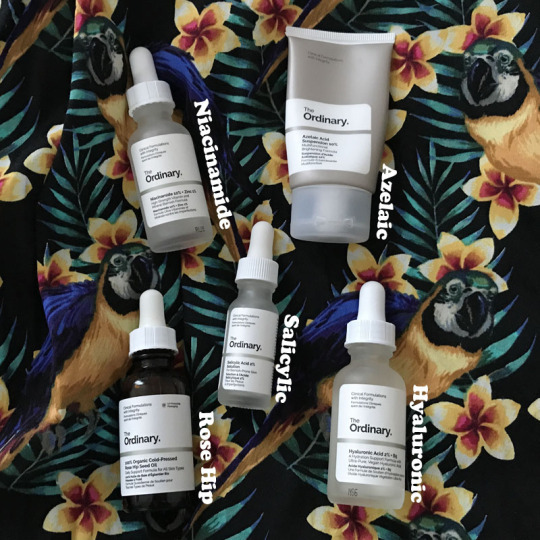 Have you tried products by The Ordinary? Share the love! Tweet me @Llia.